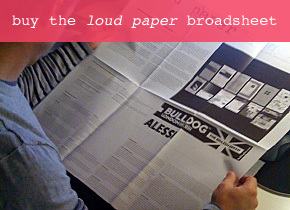 loud paper is a zine, and now blog, dedicated to increasing the volume of architectural discourse. It is a slambamgetitoutthere way of linking architectural thoughts, musings, and new work with the culture at large. loud paper is open to all students, architects, educators, girls about town, dear Johns, and critics as a place for writing loud about architecture and culture. As the world of architectural publishing is polarized into the camps of professional pragmatism and academic theory, loud paper is staunchly neither. It gets inspiration by crossing disciplines and by marching to the pulse of the street. An alternative and collaborative discourse in the arena of architectural thought is at the heart of loud paper. Mimi Zeiger founded loud paper in 1997 as a student at SCI-Arc. The publication has since received grant awards from the Graham Foundation for the Arts and the LEF Foundation. Special thanks to the dedicated crew of contributors, designers, and editors who have tirelessly volunteered their time and energies over the years, especially Gavin Browning, Richard Grijalva, Chris Grimley, Ruth Keffer, Samuel Miller, Enrique Mosqueda, and Jeremy Xavier. or subscribe to the feed.